After a successful first study visit as part of the EU-funded ASPIRE project of VNG International (Advancing Strong Partnerships for Inclusive and Resilient Economic Development), another visit was organised from 25 to 28 February. 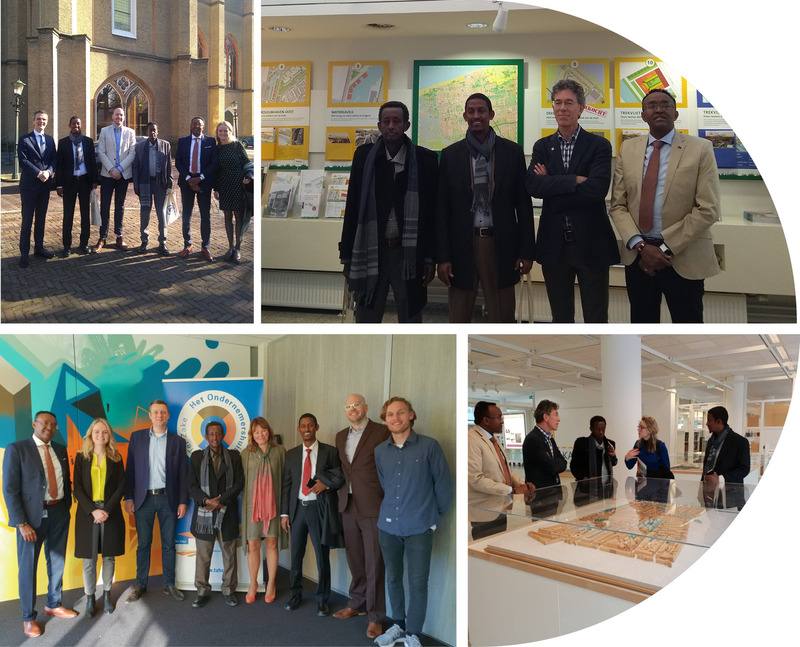 A delegation from Puntland state (Somalia) visited the municipalities of The Hague, Zoetermeer and Rijswijk to learn about the role of local governments in the promotion of local economic development and to use this to their advantage in their own country. The Puntland delegation consisted of the director of the Association of Municipalities in Puntland (ALGAPL) and the mayor of Garowe, the capital city of Puntland state. The delegation travelled to Ter Zake / Het Ondernemershuis where the municipality of Zoetermeer works together with entrepreneurs and interest groups through public-private partnerships in order to stimulate a better economic climate in the region. As a matchmaker, Ter Zake links unemployed people to companies in the region and supports entrepreneurs in setting up their own businesses. The second delegation even got a taste of a business resulting from this initiative: the lunch was organised by a catering service that was set up through support of Ter Zake. On Tuesday morning, the delegation met with senior policy officer Maarten Beks who explained the internal organization and services of the VNG. The following meeting with deputy director Pieter Jeroense was particularly interesting for the director of ALGAPL. The different tasks between directors in their associations were shared and the delegation could ask their most pressing questions. In the afternoon the delegation travelled to Rijswijk to meet with deputy mayor Marloes Borsboom-Ruabaz. In Rijswijk, the delegation was pleasantly surprised that the mayor of Rijswijk, Michel Bezuijen, had cleared his schedule to attend the meeting as well. During the lunch the delegation received a presentation from the economic team in Rijswijk about the ways in which the municipality promotes economic development in Rijswijk’s surroundings. After a presentation of and discussion with Eric de Rijk, lobbyist at VNG, the delegation visited the Town Hall of the Hague. The delegation was fascinated by the size and architecture. At the municipality of The Hague senior policy officer Henk Heijkers presented the area development ‘Binckhorst’, which unites working, living, green space and street art altogether. When discovering the town hall afterwards, the mayor and director expressed great interest in the land register shop (Dutch: ‘Kavelwinkel’), an unknown concept to the Somali context.